There are several periods during the year when we are busier than normal, (back to school, holidays and graduation times come to mind) with jam packed weekdays, weekends and longer to do lists. But we still need to eat dinner every night, right? And if you have hungry kids, having easy and quick dinner recipes to get dinner done fast can be a huge stress reducer. So if you are in a busy time, or just want a delicious dinner, here’s a baked (or grilled!) pineapple teriyaki pork chops recipe we think you’ll love. This recipe is great because you can prep before going out for the day, and then just put in the oven or on the grill when you return. It is a great kid friendly recipe and although it is certainly easy enough for busy weeknights, we think it is tasty and special enough for dinner guests -you could sprinkle with some chopped scallions or cilantro to give it that extra bit of color for guests. Preheat oven to 400. In a small bowl, whisk soy sauce, garlic, rice vinegar, water, and honey. Spray baking dish with cooking spray. 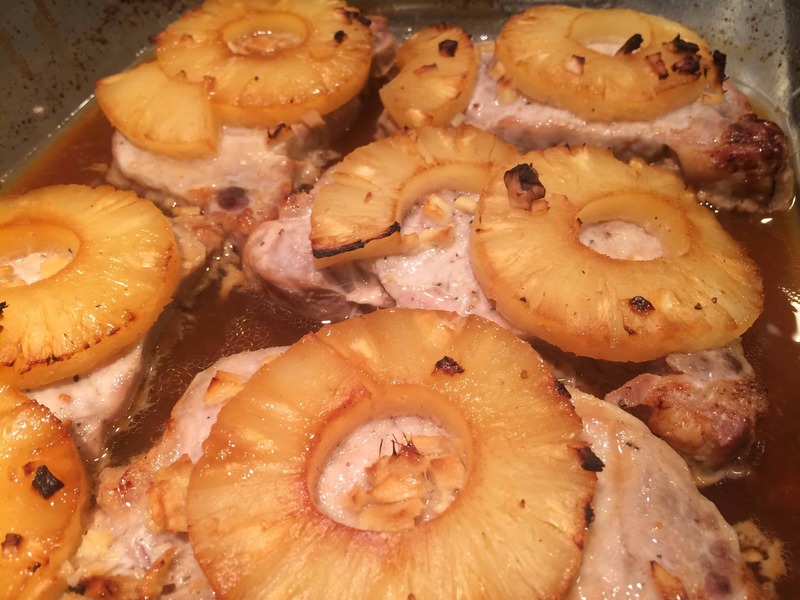 Lay pork chops in baking dish, and place pineapple slices over top of chops. Pour sauce over the top of pork and pineapple. Bake about 20 mins, depending on thickness of chops (internal temp of 145 degrees). Serving Suggestions: perfect with mashed potatoes or rice to soak up extra sauce and a simple green veggie or salad. If you don’t have rice wine vinegar, is something that can be substituted? Hi Patricia, Any white vinegar will work. The rice wine vinegar will impart more of an Asian flavor to the dish, but regular white vinegar will work as well. They have surprisingly easy and accessible recipes - I generally can get my family to eat nearly all of them, but if something doesn't sound good, you can skip that one and eliminate it from the week's menu.